Nixon Motor Sports: Sports Car Club of America (SCCA) New Web Page! Probably the largest organization that sponsors automobile driving events in the country (other than how busy the roads were to get to FREE DONUTS DAY at Dunkin' Donuts and Krispy Kreme today) is the Sports Car Club of America. NMS is happy to remind you that we are both members of the SCCA and have really had a lot of fun and learned a lot by driving in their events. 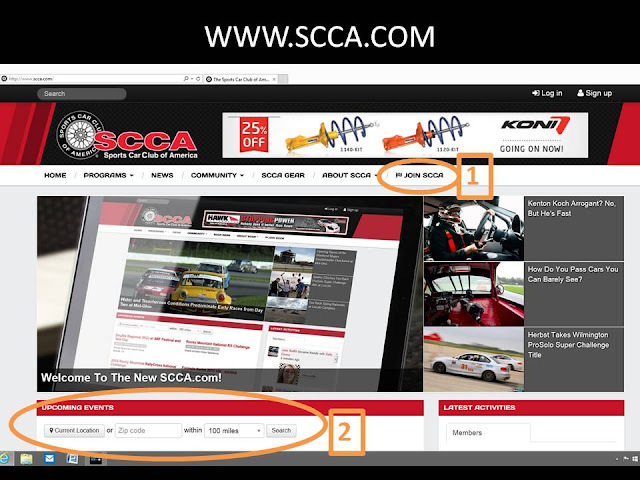 Today's real news is that today the SCCA unveiled their new and easier to navigate website, and we highly recommend you check it out at www.scca.com Having said that, here's just a quick look at the home page. #1 says "Join SCCA", so check that out and you can get more info on how to join, what it costs, and what some of the benefits will soon be heading your way. Mostly among the benefits I'd say is that you get discounted entry to most of the driving events, and a bunch of other discounts at hotels, rental cars, and other driving equipment dealers too. #2 is closer to the bottom, and this is a new feature for the home page that makes it very easy to find "upcoming events" in your area, since it lets you enter your Zip Code, and has a drop down menu for how many miles away to search for driving events. If you do that, you'll have a pretty good idea of how many and what kind of events are taking place near you, and from there you just might want to attend an event to drive, or just be a spectator and see what all the other cool kid drivers are doing. Certainly there are other groups and clubs that sponsor driving events, so particularly if you drive a Porsche, BMW, Ferrari, Corvette, and many other cars you will be able to find a group or activity that might interest you.